Roaring Brook Press, 9781596438354, 224pp. Twelve-year-old Aidan lives and works at his parents' motel on the Space Coast in Florida, so he's seen a lot of weird stuff. Even his best friend, Louis, is a little bit crazy—he's obsessed with UFOs and swears he saw one two years ago. But things at the Mercury Inn are about to get a whole lot weirder. 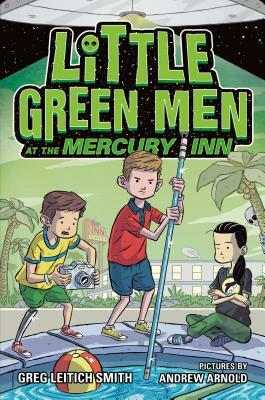 When an actual unidentified flying object suddenly appears in the sky over the motel, Aidan begins to realize that some of the residents of the Mercury Inn may be much more unusual than he thought. And Louis might not be so crazy after all. Filled with quirky characters and atmosphere, this beachy alien caper, like the aging motel where it takes place, is anything but ordinary. Award-winning author Greg Leitich Smith has never seen a UFO, but while growing up spent many family vacations in Cocoa Beach, Florida, where he watched numerous space shuttle and unmanned rocket launches. He is the author of Little Green Men at the Mercury Inn. Originally from Chicago, Greg now lives in Austin, Texas, with his wife, Cynthia, and four cats.